One of our favorite restaurants is Pei Wei. I love the food. However, I don’t like the “diner” atmosphere. The tables just feel way too close together. I require a vast quantity of personal space, 😀 . 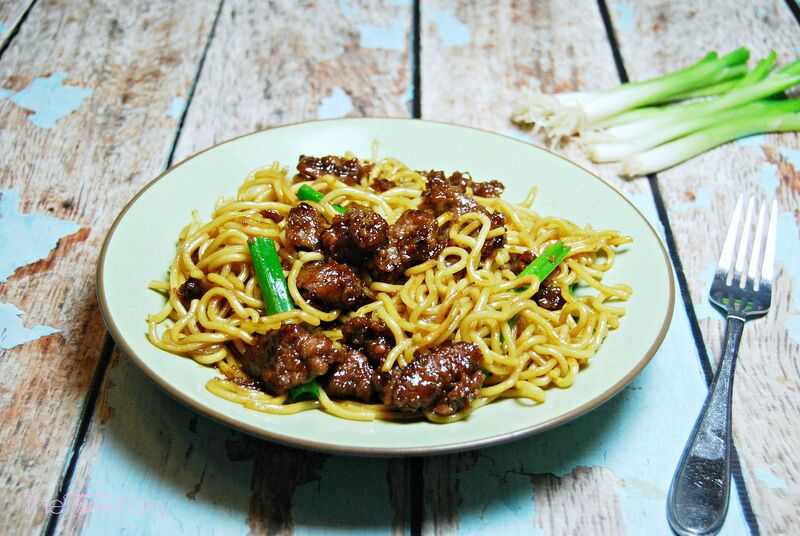 Usually when we go, all of us order Mongolian Beef with noodles. It’s so good. 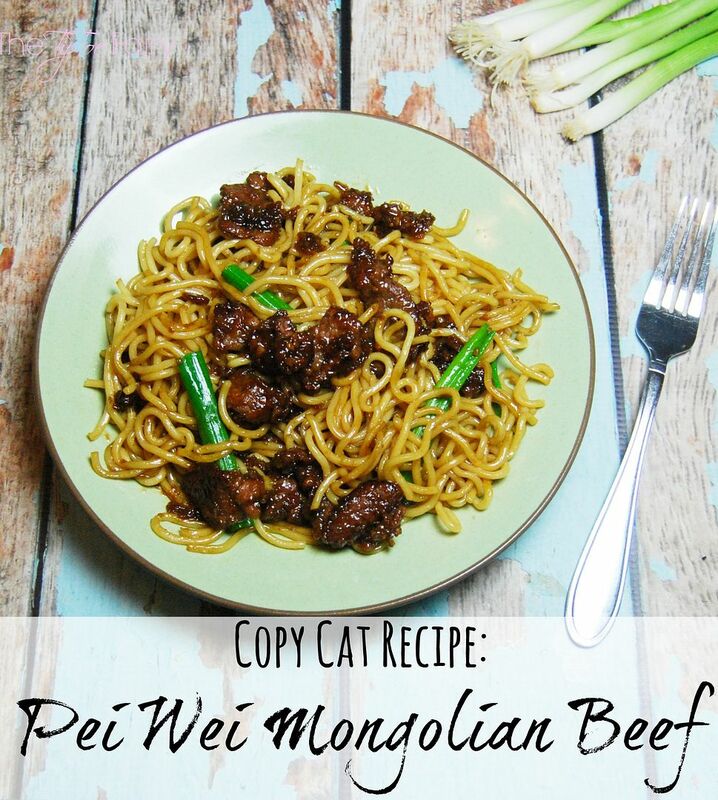 I love how the meat is a tiny bit crispy, plus the sauce is delish! My youngest loves eating the noodles. With five of us, though, it can be pretty expensive to eat there. So, I decided to challenge myself and try to make it at home. My teenager hates my stir fry, so I was ready for her to complain when I told her what I was making for dinner. Surprisingly, she was a bit excited since this her favorite at the restaurant. And, let me tell you, she loved it, Nate loved it, even Mr. E loved this dish. They all cleaned their plates and begged to take it for lunch the next day. I did run into one problem. When I went to the store to get the meat, they had no flank steak. I was going to substitute skirt steak, but they were out of that as well 8) , so I went with thinly sliced eye of round, sometimes it’s called “minute steaks.” I just sliced cut against the grain until they were around 1 x 2 sized pieces. The hardest part of this recipe is thickening the sauce because it can take awhile, like 15-20 minutes. I like to make a large batch because my family loves to eat this for leftovers. I usually make about 2 1/2 lbs of beef at a time so that makes about half for dinner time, and half for leftovers. This means I have to brown it in two batches, which takes about the same time as cooking the sauce, so I’m able to do it all at once, which speeds up preparation. Much like making a gravy, you’ll feel the difference of a heaviness when you stir it, and that will tell you it’s thickening. When I can feel it thickening, it feels heavier, and I let it go for another 5 minutes and then turn the fire off. Slice beef into small pieces. In a large bowl combine beef and 1/3 cup corn starch and mix until well covered. Mix 1 1/4 cups cold water with 1 tablespoon corn starch. In a saucepan combine water/corn starch mixture, soy sauce, garlic, and brown sugar. Allow it to come to a rapid boil and simmer on medium high. While this is cooking, heat up a large skillet with 2 tablespoons of olive oil on medium. Once the oil is hot, add half the beef and cook until brown. Transfer cooked meat into a large casserole dish. Cook the second set of beef until brown. At this point, the sauce should be thickened. Remove from fire, and add half the sauce to the browned beef still in the pan. Cook until the sauce is completely on the beef, but no longer liquid in the pan. Add this beef to the casserole dish, and get the first set of beef. Add the sauce to the first set of beef and cook the same. Once done, add to the casserole dish. Take four pouches of noodles (precooked) and add to large skillet. Add any residual sauce and cook for just a few minutes. Remove from pan and mix with the beef in casserole dish. Garnish with 2-inch cuts of green onions. 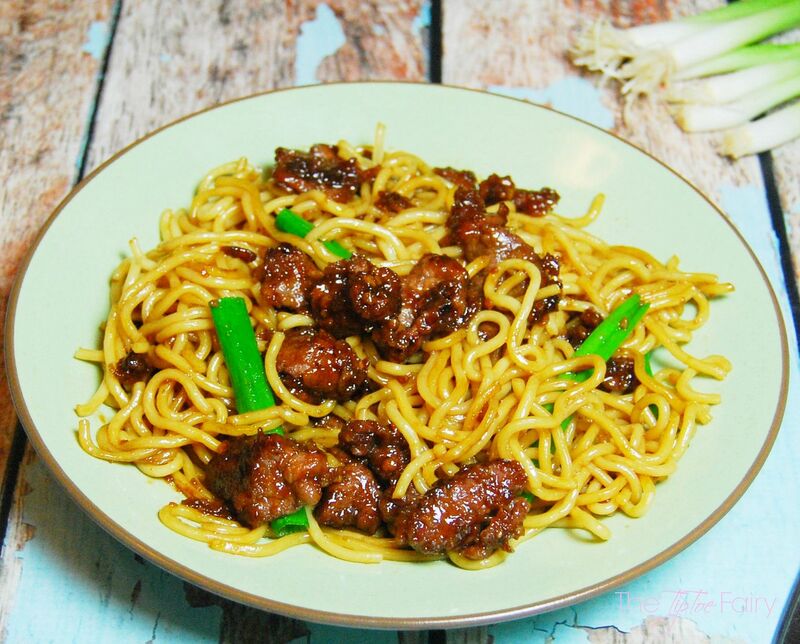 If you don’t purchase precooked chinese noodles, you can prepare even spaghetti pasta ahead of time. Just make sure to toss the spaghetti in some olive oil after it’s cooked. I hope your family enjoys this as much as we did! 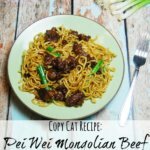 What copy cat recipes do you like to make? this dish looks yummy! I was wondering where you buy precooked noodles? If they are Chinese noodles, what brand name should I look for? I know Walmart sells precooked noodles. They are in the international section where you can find the Asian food. Often, I buy Udon noodles. I can’t remember the brand, but it clearly says “Udon.” They come in a vacuum packed bag, I think it’s white, and you can see the noodles. They have various noodles in that same brand, and I’ve tried all of them, and they all work great for stir fry. I also buy a yellow colored noodle in the same place, but they are not precooked. They tend to be cheaper, and cooking time is super quick, like 3 minutes. It’s in the same place. They have a red label and you can see the yellow noodles in clear packaging.